"It's easy to stay motivated when you're doing what you love. Find what you love and do it every day." "Success is based on targets that we set for ourselves. Sales cures all. So if your metrics add up then you'll be happy." "A new idea is only relevant if it is solving an existing problem. Identify the underlying problem, create a feasible solution, and then steer it towards directly addressing your customer's need." Eric Muli has always had a knack for identifying business opportunities. After graduating from Babson College in 2014, he moved back home and co-founded Odyssey Capital Limited – the company behind Lipa Later. Lipa Later is a facility that provides electronic loans, business loans, and salary loans to individuals and businesses in the low to middle income bracket in Kenya. According to Muli, Odyssey Capital is the first and only company in East Africa that offers niche financing to low and middle income earners. The idea to venture into consumer financing came up when Muli and his co-founder Michael Maina learned that it was almost impossible for millions of Kenyans to afford essential technology like smart phones, television sets, refrigerators, and even electrical fixtures and fittings. Banks and other investors were not keen to invest in this demographic because they thought this would be a big risk to undertake with no guaranteed return on investment. Realizing this was a big untapped market with a high demand for financial products and services, Muli and his partner registered Odyssey Capital Limited and went straight to work. Today, the company has financed thousands of individuals through the Lipa Later product and disbursed over KES 100M in financing. Lynette wanted to sell second hand clothes but didn't know where or how to get the funding she required. Odyssey Capital stepped and was able to provide her with the startup capital she required. Muli’s growing success hasn’t come without challenges. Fundraising is an issue which every successful entrepreneur has encountered, and continues to encounter. Muli says business owners need to be creative and keep providing solutions to unique problems in our society. 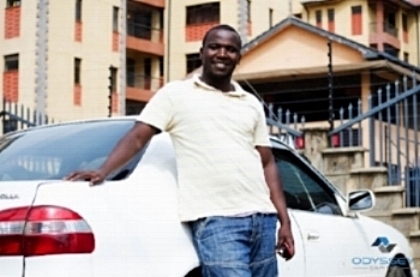 Odyssey was started with profits from a small security business Muli started when he was still in university (Alpha Force Security), with some additional funding from personal savings. Because he needed funding to jump start his business, he began knocking on doors and making phone calls to anyone who cared to listen to his business pitch. The first investment the company received was fifty thousand Kenya Shillings. “This amount did the trick back then” he says. Once someone has secured funding, what most entrepreneurs find challenging is building the right team. For Odyssey Capital, Muli says his biggest challenge was getting his team to share in the vision, passion and drive that both he and his co-founder had for the company. Though it has been a challenge, he has built an excellent team, and along the way learned a few interesting things about managing teams. To build a strong customer base, Lipa Later is accessible and flexible to a large demographic. The product is designed to meet customers at their point of need. To heighten its reach to a larger population, the company has a vast network of sales agents spread out across the country. Leveraging social media has also worked really well as a means of getting new customers, alongside heavy use of technology and innovation to make sure clients are satisfied with the company's customer service and product/service offering. 1. You must have drive and commitment. Nobody should want it more than you do. 2. Sell yourself and your product or service. Sales cure all. By learning how to sell a product/services, or even how to sell yourself, you will be able to talk to strangers and give yourself unlimited options. Do not be afraid to put yourself out there. 3. Network. Network. Network. This has been one of the most important things that has directly contributed to the growth of Odyssey Capital. In the near future, Odyssey is working to expand its physical presence across Kenya. The company has set up shop in Mombasa County, and is looking to do the same in several other premium towns across the country. In 2018, Odyssey Capital will be structuring itself to expand to the rest of East Africa. Muli is working towards launching a consumer focused bank in the coming years. His passion for inclusive and sustainable economic development began when he was in University. While most students were juggling classes, and experiencing every day college life, Muli experienced the same, but went ahead and set up several successful ventures that are still up and running today. He co-founded Jossle – a US based marketing agency for brands that reach out to, and sell to college students, and Zabamba – a social network platform that allows users to search and give reviews, opinions and individual ratings on products and services in Kenya. He also founded Alpha Force Security Limited while he was still a student. Alpha Force is a security company based in Kenya that sells security systems and infrastructure to domestic and commercial sectors. It also provides professional 24 hour security guards. He’s worn glasses since he was four years old. Zero to One by Peter Thiel, and Steve Jobs (autobiography) are two books that have been extremely instrumental in shaping his thought process to start and run his businesses.